By Jim Henry The Joplin Globe The Ron Jones family centers around basketball. And it has for many years. Among Ron and daughters Shakara and Sharese “Winkie” Jones, they have combined to score 8,312 points during their high school and college careers. 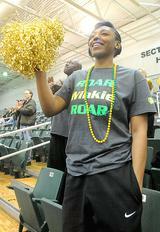 That number will continue to grow as Sharese is completing her sophomore season at Missouri Southern.